Many people love to shop. They want to find the perfect thing at the right price for many objects. 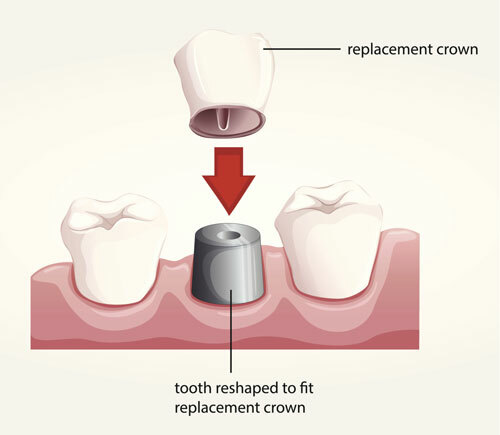 When it comes to dental crowns, people may not think they can look at different options. They do not realize that there are different types of crowns for them to choose from. It is time to learn how to find the best crown for you. There are four different types of crowns for people to choose from. The types of crowns differ on their use, the way they look, the cost and the amount of time they will last. Choosing the right crown starts with understanding the different types. • Ceramic Crowns - This type of crown is one of the most popular choices. It is affordable, and it can last a long time. It is most often used to replace the front teeth because it is the most natural looking and the easiest to blend in with the other natural teeth. • Porcelain fused to metal - This type of crown is extremely durable while also providing a natural looking replacement. • Gold Crowns - People may think that gold is a soft metal and is not suitable to replace a tooth, but a gold crown is a mix of gold, copper and other metals. It is extremely durable, but it does not look like a natural tooth. • Base metal crown - This provides a very strong crown and is the best at preserving as much of the natural tooth as possible. It is durable and long lasting but does not have the natural look. Making the decision for what type of crown will depend on the budget you have and the look you want. Some may like the idea of a showy gold tooth, while others will want something that blends in with their natural teeth. The strength of the crown and the cost of the crown are other factors in the decision. These are the things to consider when choosing the right crown. For more information about this contact our offices to schedule an appointment.